The Third ER Congress a Great Success! Some 130 participants from 24 countries came together for the Third World Congress on Extensive Reading, held in Dubai, at the HCT Dubai Men’s College from 18 to 20 September. While the numbers were smaller than in the past two congresses (2011 in Kyoto, 2013 in Seoul) the enthusiasm was high, as well the quality of the presentations. Scholars from Australia, Bahrain, Brazil, China, Egypt, Ethiopia, Indonesia, Japan, Korea, Malaysia, Mexico, Oman, Philippines, Qatar, Romania, Saudi Arabia, Singapore, Taiwan, UAE, UK, the USA and Vietnam participated in the three-day event. The Congress was highlighted by three excellent plenary sessions, Willy Renandya on “The Power of Extensive Listening” (Friday), Fredricka Stoller with “Shaking the Sand Out of Our Boots: Building a Better Extensive Reading Oasis” (Saturday) and Rob Waring on “What Exactly is Extensive Reading?” (Sunday). Videos of the three plenaries, as well as some of the other sessions will be available shortly on Youtube. The event was also graced by the presence of six scholarship awardees, pictured above. 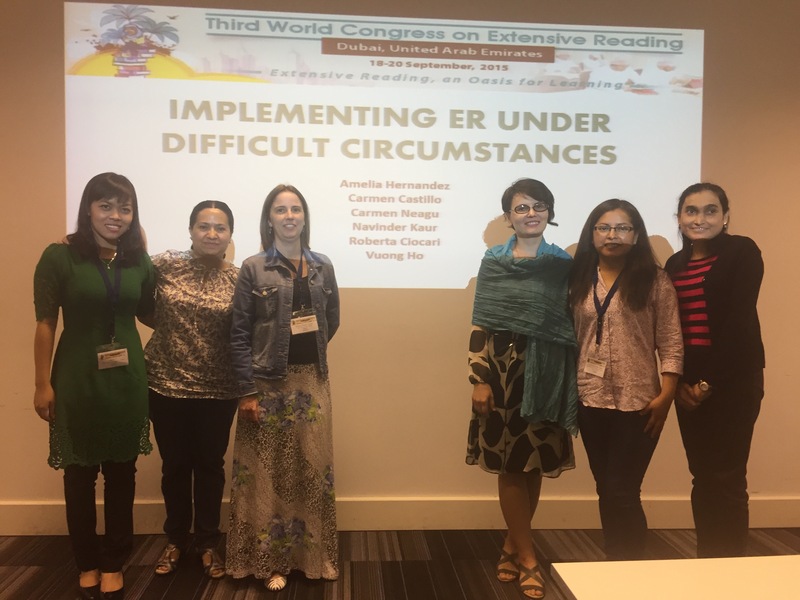 In addition to a number of individual papers, they also presented their collective ideas on dealing with “Implementing Extensive Reading under Difficult Circumstances”. Pictured from left to right, Vuong Ho (Vietnam), Carmen Castillo (Mexico), Roberta Ciocari (Brazil), Carmen Neagu (Romania), Amelia Hernandez (Mexico) and Navinder Kaur (Malaysia). All received airfare, hotel accommodations and a fee waiver from the ERF.